Golden Apples: First of the Month Free-be--Lacy edging. White Light; Fractured right, spectral delight. First of the Month Free-be--Lacy edging. Edging are a great way to start or finish knitting. I love Nicky Epstein's books on edgings –Knitting on the Edge, Knitting Over the Edge and Knitting Beyond the Edge. Together these books present over a 1000 ideas for edges and edgings. But there are hundreds of thousands of potential designs for edging. Here is one of my own designs for edging. This pattern, like any stitch patterns, can't be copyrighted. But my words, descriptions, and photos can be, and are. If you'd like to use this edgings, in your own design, feel free to, but it you want to use my directions for these edging in patterns you want to sell or distribute, please contact me for permission.. (there is a mail link on my about page). If you do use them, I'd love to see how! N. B.—2 of the YO's will fall 'on top' of the gaps created by the 3 stitch bind off. Row 4: Knit every stitch, increasing/decreasing stitches, to correct count as needed. This edging, (Large Lacy Picot) if worked in 5, 6, or 7 repeats, and then on Rows 3 and 4, the pattern is changed to * decreases (k2tog) across the row, can easily be changed into a star like flower motif. 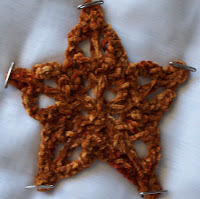 After row 4, the final stitches can be threaded onto a drawstring, the seam sewn, and the result is a star like flower. It would also be excellent as an edge on a sweater, (for cuffs or hems) or as an edge on a collar.